When you begin planning your family vacation in the Smokies you might not think of your family as needing one of our large cabins in Gatlinburg Tennessee, but large family vacations, like family reunions, are becoming increasingly popular, and when you start adding in siblings, grandparents, aunts, uncles and cousins, group size can increase quickly! We have smaller, 4 bedroom cabins available to accommodate groups with as few as 14 guests, and they’re loaded with 5 star, resort-like amenities that everyone will love! With the University of Tennessee’s close proximity to the Smoky Mountain area, there’s no doubt that many UT alumni will be heading to the Smokies for a quick stay during home game weekends. If you’re planning to come for a game or two, why not make a long weekend of it by getting the whole game day group together and staying in one of our large cabins in Gatlinburg Tennessee? Our 4 or 5 bedroom cabins are the perfect size for game day groups and offer plenty of alternative activities for downtime before and after the game. 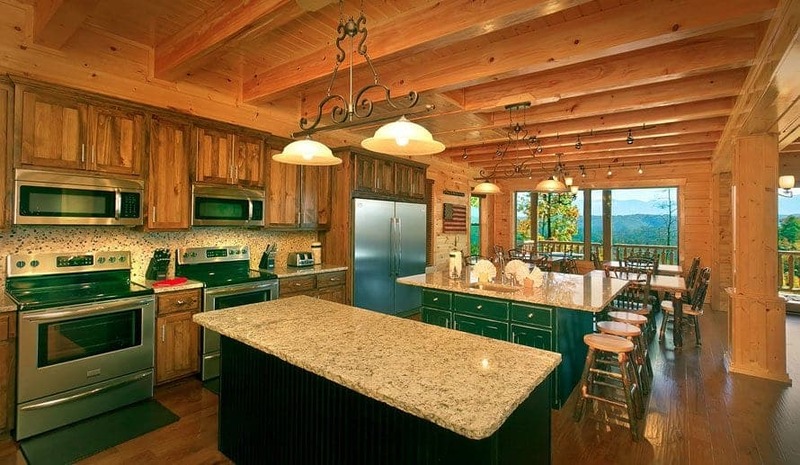 These large cabins in Gatlinburg Tennessee are equipped with everything you need to enjoy the weekend (whether or not you have tickets to the game) including multiple large TVs so you don’t have to miss a single play, large kitchens for preparing your favorite game day foods and much more! Many church groups have decided that fall in the Smokies is the perfect time to gather congregation members outside of the church walls and step out into God’s creation for a fun and relaxing time together. No matter the size of your church, we’re sure that one of our large cabins in Gatlinburg Tennessee will meet your needs! Whether you’re looking to attend the National Quartet Convention in September, attend free Gospel concerts at Dollywood’s National Southern Gospel and Harvest Celebration, or spend quality time in the great outdoors, you can’t go wrong when you choose the Smokies as your church retreat destination! The range of sizes and amenities offered in our large cabins in Gatlinburg Tennessee make us the prime choice for the many different types of groups that visit the Smokies ever year. Our lodging is top-of-the-line and we will work with you to help you save as much money as possible during your stay! Check out our large cabins in Gatlinburg Tennessee and let us know if we can assist you in any way throughout the reservation process!